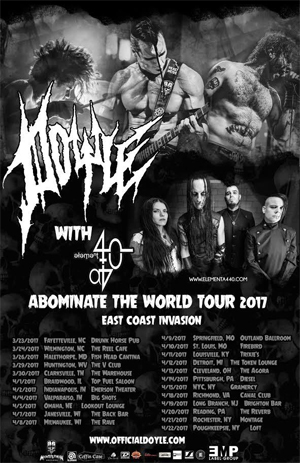 Currently wrapping up the European leg of the ABOMINATE THE WORLD Tour, DOYLE, the eponymous band of Legendary MISFITS guitarist DOYLE WOLFGANG VON FRANKENSTEIN has announced their first US dates of 2017, the first supporting their upcoming Doyle II: As We Die, in stores May 5th from EMP LABEL GROUP, and Doyle’s own MONSTERMAN RECORDS. As We Die will be available Worldwide on CD and LP May 5, and is currently available for pre-order from empmerch.com, including several international versions with alternate artwork configurations, including art by legendary horror/comic/album cover artist Mister Sam Shearon, known for his iconic works with ROB ZOMBIE, IRON MAIDEN, CLIVE BARKER, KISS, MINISTRY, RAMMSTEIN, X-FILES, and more. In addition to As We Die, EMP/MONSTERMAN will release several limited edition vinyl configurations, as well as a CD reissue, of DOYLE’s Abominator Album, and releases from DEAD GIRLS CORP., ELEMENT A440, and more. DOYLE, the current project of Von Frankenstein, with CANCERSLUG vocalist Alex “Wolfman” Story, and a current touring lineup rounded out by bassist Brandon Strate and drummer Brandon Pertzborn, continues the lineage of Doyle’s former projects, pairing crushing metal riffs with ferocious Punk Rock swagger.